Another award! 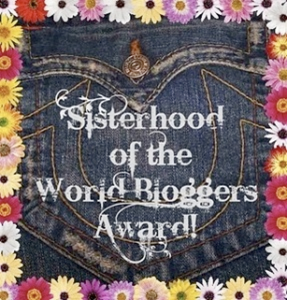 *soooo excited* The Sisterhood of the World Bloggers Award! Before I started blogging, I didn’t even know that such awards exist. They’re fun, that’s for sure. But also, you know, I find that these awards are one way for me to discover and connect with other wonderful bloggers out there. One way for me to find more blogs to follow. So cool, right? A few weeks ago, Patricia Macias, one of the friendliest authors out there, tagged me (on Facebook) with this award. At first, I thought that it just went around on Facebook but she mentioned that it should be posted on my blog. So, here it is! Thanks again, Patricia! :D It took me a long time to post this as I did a lot of things last week, plus, my son got sick (Tonsillitis – yikes! ), and now, I’m a bit under the weather as well. Anyway, I can still manage. Go me! 1. Include the award logo somewhere on your blog. 2. Answer these 10 questions below for fun, if you want to. 3. Nominate blogs you enjoy up to 12. 4. Pay the love forward: Provide the links of your nominees in your post and comment on their blog to let them know they’ve been included and invited to participate. 1. What is your favorite color? Pink. All shades. 4. Facebook or Twitter? Facebook. I love Tumblr, too. 8. Favorite day of the week? Dare I say, Monday? 10. What is your passion? Reading and writing. One tiny noob question: What does it mean by pattern? LOL. You know what, I wasn't sure of my answer here as well. I think it's asking for design patterns as the person before me, Patricia, answered 'scrolls' so I figured it's about design patterns. So there. Haha. Sorry. Thank you so much Ara! You're awesome!